This innovative picture-in-picture video generator provides high-quality dual-channel video display on one screen for monitoring/recording purpose. The 2nd video channel window is inserted into the main video screen in real time. Both video inputs are synchronized accurately so the mixed output channel can be displayed simultaneously. The PIP window sizing and positioning are controlled directly from the front panel of this video processor. A fast input swap button is also provided for revering between the main and PIP input channel. 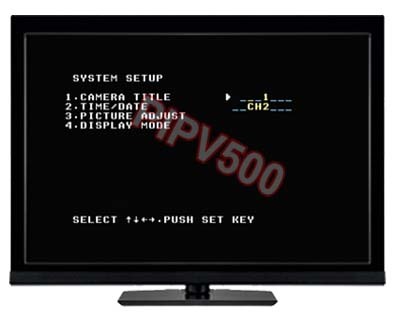 This picture-in-picture video generator supports all standard analog video equipments through either RCA or BNC cable connection. Great video module for further integration with other video system for surveillance, video editing/capturing, post production, etc. This PIP screen processor system is featured with dual-channel frame synchronized output. The internal frame synchronizer can help re-generate all sync signals from inputs for smooth and quality video output in real time without any lags. 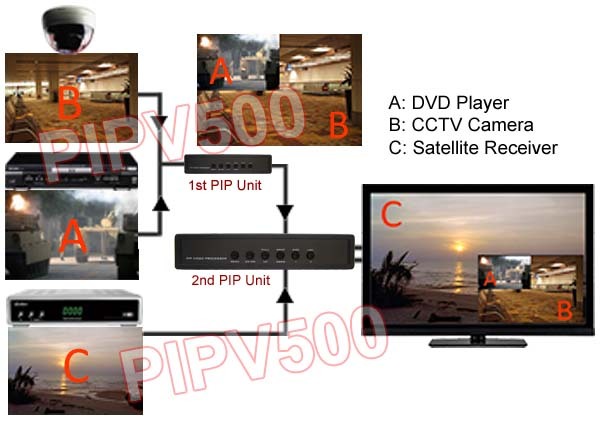 This unit provides two simultaneous video outputs, which can be connected to either two TV monitors for display or one for display and the other video output can be used for recording/capturing through DVD recorder, DVR, PC or any other video capture device. A one-touch swap button designed for fast swapping between the main channel and the sub video channel instantly. Main video screen and PIP screen can be exchanged instantly with simply pressing the SWAP button. 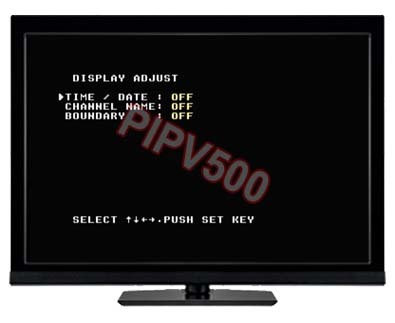 Users can easily turn the PIP screen into the main screen on TV right away while the original big screen channel becomes the PIP channel with smaller window screen displayed at the same time. This system helps users watch DVD video or satellite channels while keeping an eye on the nanny cam or surveillance camera video from the smaller PIP window. Never miss a move or starting your favorite program. PIP Size: Users can re-size the PIP window screen at 1/16, 1/9, 1/4 and up to full screen for display. 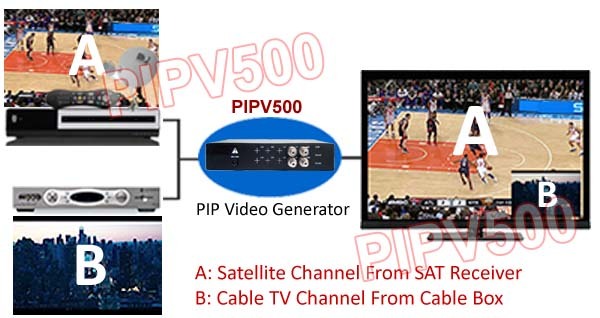 PIP Swap: Fast video input swap between main video channel and the PIP channel. This video image processor will memorize users' settings in the system buffer once configured or adjusted. 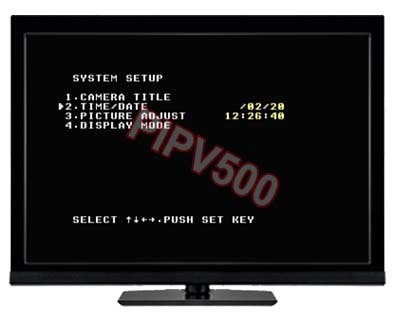 The previous PIP screen mode will be displayed right away in the same configuration after power cycling or power outage. No need to set up this video processor again for the desired screen mode again after the power off. Camera Setup: Users can edit the video channel title as needed. Each channel description/title can be up to 8 characters. Date/Time Stamp: setting up device date and time for visual and recording purpose. Picture Adjustment: Individual color adjustment for brightness, contrast, hue, saturation, tint and sharpness control. Display Setup: options such as video channel/camera name, date/time and PIP screen border can be turned on or off manually. This PIP unit has title generator and date/time stamp for editing entry of video channel titles, date and time on video channels. The date/time stamp and titling function is essential for showing information of date, current time, channel description/title on video channels for monitoring/viewing purpose and recording/capturing sessions. The channel titles and date/time stamp can be turned off manually from the OSD system menu. This PIP video generator can be used as standalone unit or cascaded together to process more video inputs or combined with other video mixers or A/V switches to form a large display system, great video module for professional installers for expanding current client's setup at any stage. Professional picture-in-picture video generator with advanced video processing. Selectable PIP mode for 2 channels or full-screen mode for each individual video channel. Easy installation and fast setup provides the perfect solution for permanent and mobile presentations. Real-time dual-channel output with sharp and clear picture quality. Featured with dual-channel frame synchronizer for re-generating all sync signals from inputs with smooth video output. Users can change the PIP window screen size at 1/16, 1/9, 1/4 and up to full screen for display. Supports adjustable PIP window location at 15 pre-set locations. 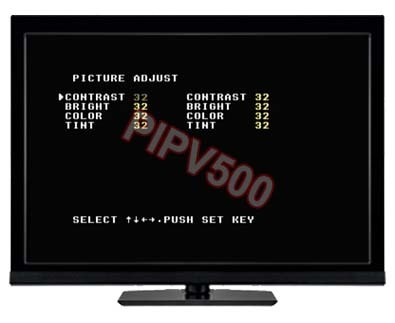 Fast video input swap between main video channel and the PIP channel. Supports border line On/Off option for PIP screen mode. Supports time/date stamp for viewing and video recording. Easy on-screen OSD setup menu for user friendly configuration. Supports all NTSC and PAL video systems. Non-volatile system memory saves all user settings and protects them against power outages.